An introduction to the issue points out that Salt Lake City's intense and seemingly uncontrolled growth actually stems from deliberately planning - both to develop the city and to prepare for the Olympics. Does Utah know what's coming? 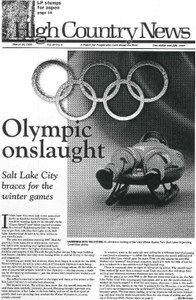 Salt Lake City has succeeded in its long, controversial bid to host the Winter Olympics - but now that the Games are only four years away, many Utahns are having second thoughts about them - and the city's already rampant growth. In his own words, John Cushing, mayor of Bountiful, discusses his dissatisfaction with the Salt Lake City Organizing Committee and his doubts about the Olympics. Can a ski town survive its moment of glory? Once a funky former mining town, Park City is now a booming ski resort and bedroom community, and some locals worry that the Olympics will only make things worse. Club 20's report on "The Decline of the Aspen" fails to convince that the only way to save western Colorado's aspen groves is to log them. The strange dysfunctional state of Idaho - with its neo-Nazis and child abuse and stubborn isolation from the rest of America - leads the writer to leave the state after 15 years. The Forest Service will hold 25 open houses about its proposed 18-month moratorium on building new roads in forests. Reservations for camping in Glacier National Park may be made up to three months in advance, beginning March 15, 1998. All media in Colorado that have covered the issue of sustainability are eligible to apply for a media award from the University of Colorado's Wirth Chair in Environmental and Community Development Policy. The mouse that roared "Preble"
The Preble's meadow jumping mouse, which thrives in the same habitat as houses and developments, could bring growth on Colorado's Front Range to a halt if it is listed as endangered. None of the current bills in Congress to rewrite the Endangered Species Act are pleasing to all environmentalists, developers or the politicians debating them. The federal agency that approved the merger of the Union Pacific and Southern Pacific railroads may reconsider its decision in the face of economic and industrial troubles caused by railroad gridlock and inefficiency. Santa Fe Mayor Debbie Jaramillo loses to Larry Delgado; Wilma Mankiller honored; Babbitt under investigation; Sierra Club voting on immigration; lawsuit over Arizona flash flood; People for the West now for the USA. The state of Wyoming wants to vaccinate 2,000 Yellowstone area elk against brucellosis, but the U.S. Fish and Wildlife Service has its doubts. Chronic wasting disease, a relative of mad-cow disease, is killing deer and elk in Colorado and Wyoming. Members of five Native American tribes are protesting the government's plan to store nuclear waste in Ward Valley, Calif.